Coming after alldata 10.52 repair manual, Alldata torrent 10.53 hot selling for a long time. 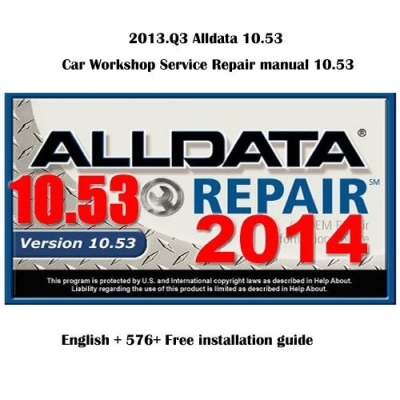 Alldata repair Manual professional workshop service and repair manual, maintenance, wiring diagram, diagnostic. Do you know how to install Alldata torrent 10.53 software. Below Obd2tool.com sharing Alldata torrent 10.53 Alldata repair Manual 2015 All data 10.53 Installation Guide. – Before you install, carefully examine the installation instructions(included in Mobile HDD)! Turn off the internet! Use a firewall to block any attempt to access! 4. Use a firewall to block any attempt to access the internet! 5. Just open alldata 10.53 program. ALLDATA 10.53 (Q3 2013) is the final edition of this DVD containing the most complete database with original information from car manufacturers. With AllData we can have instant access to a single source for diagnostics, repair and maintenance. We can consult with complete security the correct data to repair a specific vehicle as indicated by the manufacturer. As this database, it covers more than 33,000 specific engine vehicles. It includes the repair of procedures, diagrams and the specific PSOs for each vehicle. AUTEL MAXISYS MS906 is next generation of autel maxidas ds708. Maxisys MS906 run faster speed than DS708. Autel Maxisys DS906 has bigger touch screen than Maxidas DS708. OBD2TOOL dot com offer Autel MS906 with 2 Year Online Update, it save much cost for you to get it. 5. With a Big Screen, Android 4.0 OS. 6. Run faster than Autel Maxidas DS708. Orignal Autel MS906, MAXISYS MS908P, MAXIDAS DS708 in different shapes are all excellent diagnostic scanners with full basic functions and a wide range of vehicle coverage. 1. Autel Maxisys MS906 run fastest. 2. Autel Maxisys Pro MS908P can do ECU programming and support Bluetooth Function.